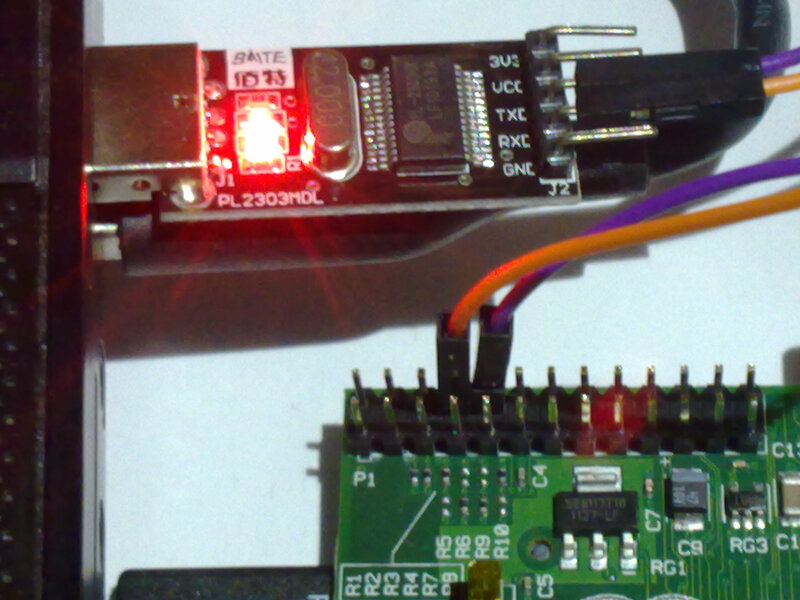 It's fairly easy now to run headless from scratch with a Raspberry Pi. One area that might have an issue though is debugging issues with devices that have been added to the Raspberry Pi. Often you get indication of these problems in the messages that scroll through during boot. Are these messages echoed anywhere - to a log - or are they only available if you connect a monitor during boot? Yes, there are logs for everything. [16037.102425] USB Mass Storage support registered. /var/log/boot - For all boot messages, such as daemons starting. /var/log/Xorg.0.log - All Xorg logs. Including any errors. /var/log/errors.log - Any system error will also be logged here. Here is how to connect it to one of the PL2303 UARTs that can be found on ebay for a few dollars. I didn't need to connect GND because I am powering the RPi from a USB port on the same computer. If you just want to see the boot messages, you'd only need the orange wire. If you want to log in once it boots, you'll need the purple wire too. If you need to connect GND, it should go to the pin to the left of the orange wire. If you're looking for systemd boot messages, you could find them in /var/log/boot.log (I think you have to install bootlogd for that) or in the virtual console /dev/vcs1. Not the answer you're looking for? Browse other questions tagged boot headless or ask your own question. How to investigate why device crashed? How to see debug logs from Raspberry Pi 3 during boot process?